With Easter fast approaching, I was particularly pleased to find this little gem amongst objects recently acquired as part of the collection of the Plastics Historical Society. 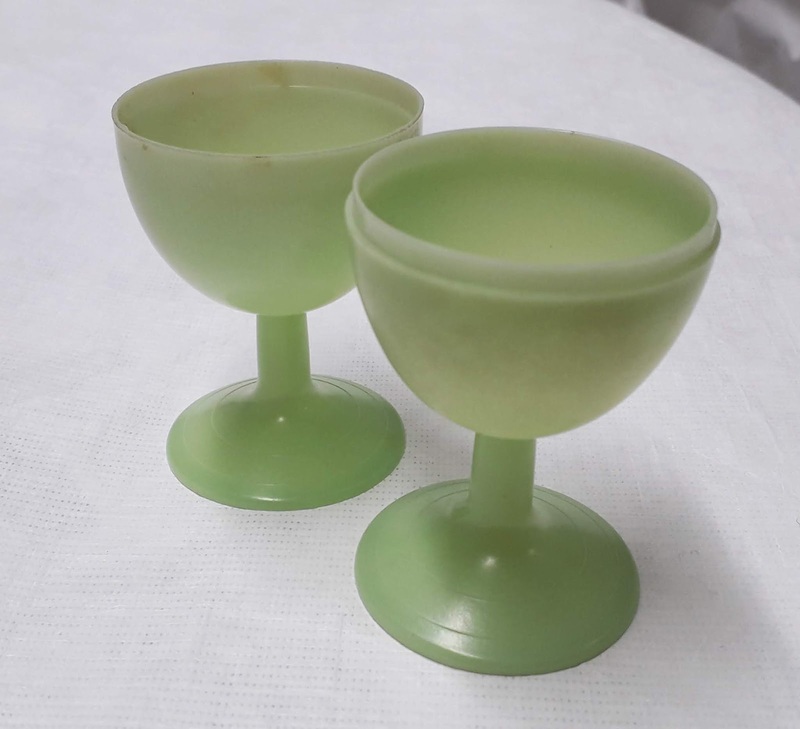 Small and perfectly formed, this small green egg contains two simple bases which push into the upturned half egg shells, to form a pair of egg cups. 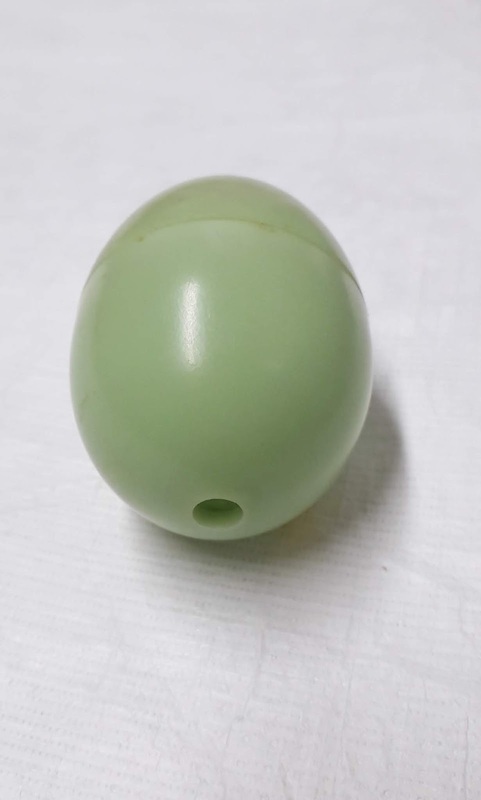 Made from green urea formaldehyde we think it dates from the 1930s, but it has no makers marks to help us with identification. Egg cups can perhaps be seen as a miniature manifestation of the prevailing stylistic influences of the time in which they were made, with the colour and materials used as extra clues to their date of making. So many of them are unmarked and the ones we have here in the collections of MoDiP and the Plastics Historical Society include many anonymous examples. There are, however, examples from well-known makers such as Bodum, Tupperware and zak!, and for those particularly interested in older plastics materials, Ranton, Mendel Brothers, De La Rue and NB Products. We even have an example of the Yowk pot, packaging designed to hold a healthy on-the-go snack of a pre-boiled egg, breadsticks and seasoning. 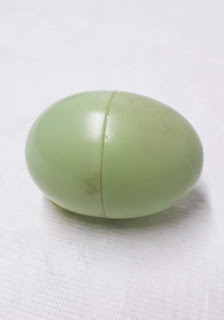 The packaging is designed in such a way that when turned upside down, the top becomes an egg cup. This idea was short lived because of inconsistencies in cooking the eggs. If you would like to come in and see any of these objects, or anything else from the collection, please contact a member of the MoDiP team. Pam Langdown, Museum Documentation Officer. 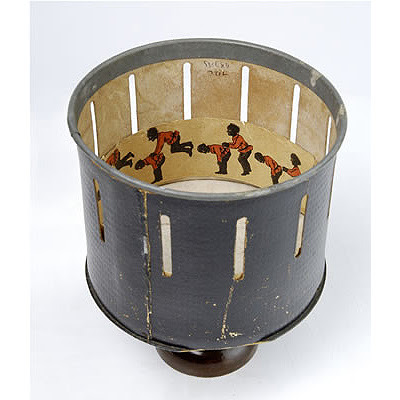 MoDiP has recently acquired this Oxfam Jerry Bucket, an improved version of the original 1998 design. Always intended as a safe water container as opposed to a multipurpose bucket, this 14L capacity, heavy duty, UV resistant, plastic water bucket has a tight-fitting lid, robust flat handle and clip-on cap. Agency workers started to observe people using the bucket without the lid - an integral feature for the transport and storage of safe drinking water. 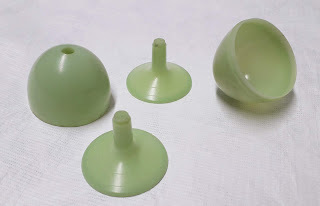 The previous cap had been so small, that filling the bucket from a tap, pump or spring had been too difficult, resulting in the lid being removed and inevitably never replaced. The buckets then began to be used for carrying food and washing clothes. Consequently, Oxfam redesigned the lid to include a rim-lock system, so once snapped onto the bucket it is very difficult to remove. The cap opening was also made bigger to not only ease filling but allow easy access for cleaning. 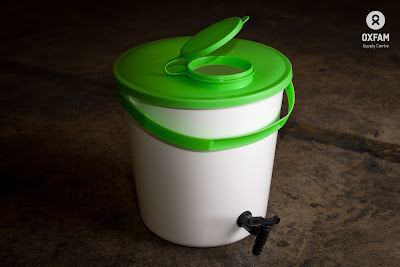 Made from polyethylene, the bucket offers a safe solution for water storage, protecting from pollution and further contamination. It has become established worldwide as a standard safe water container, and is used by many other relief agencies including the UN and the Red Cross. We would like to thank Oxfam for donating this bucket to the MoDiP collections - and you will soon be able to see it on display in the 'About Plastics' case in the museum. Katherine Pell, Museum Collections Officer. In 1928 Wallace H. Carothers, an organic chemistry lecturer at Harvard University, joined DuPont, a chemical manufacturing company, to lead a research team identifying potential commercial uses for different polymers. 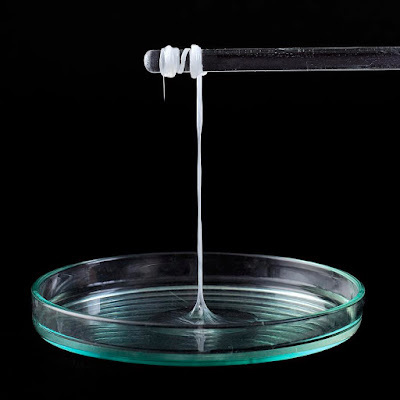 After several years of experimentation, the chemists produced a material that could be drawn out into long, thin strands which were extremely strong and durable. 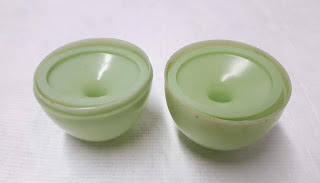 It was patented in 1937 as nylon 6,6. Nylon is not just one material but instead refers to a family of very similar polymers known as polyamides. The original and most commonly used of this family was nylon 6,6 but other chemical manufacturers wanted to reproduce it without breaching the patent on its production. Many different versions have since been created which in turn all have different properties eg. nylon 6, nylon 6,12, nylon 4,6 etc. The first commercial product to use this synthetic material was Dr West’s Miracle Tuft, a toothbrush with nylon bristles released in February 1938. 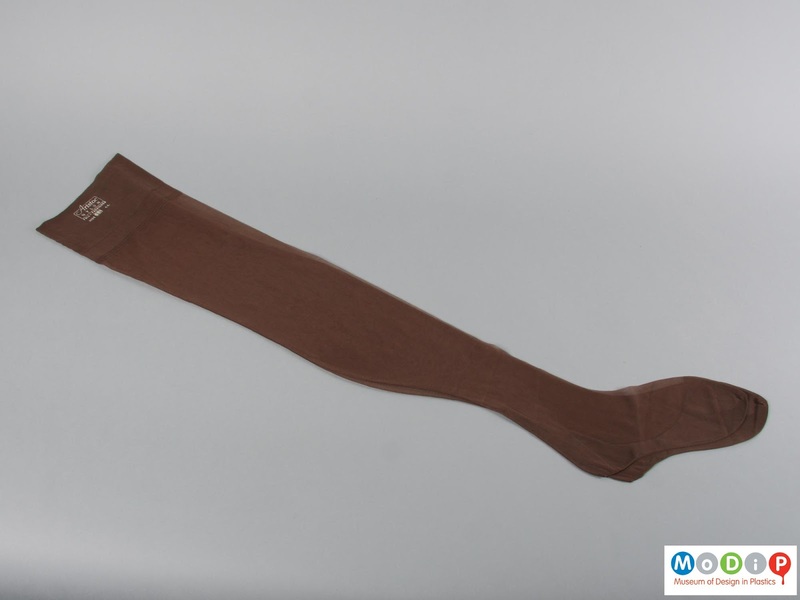 DuPont soon realised nylon’s characteristics were ideal for the hosiery market and built a factory in Delaware the following year that ran for 24 hours/day, producing enough yarn in its first year of operation for 64 million pairs of stockings. Introduced to American consumers on 15th May 1940, 800,000 pairs were sold on that first day. At a cost of $1.15 per pair, they looked like the more expensive silk stockings but were cheaper, more robust and easier to care for. But no sooner had they appeared on the shelves of department stores across the United States, they disappeared as the country entered the Second World War. Supplies became severely restricted as output was channelled into military use with nylon producing such vital equipment as parachutes, tents, mosquito netting and hammocks. As soon as the war ended DuPont resumed stocking production with demand quickly exceeding supply: newspapers reported ‘nylon riots’ taking place as thousands of US women mobbed stores with limited stock. The first British made ‘nylons’ appeared in 1947 such as the pair featured in the photograph above from MoDiP’s collections and currently on display in the Plastics & the home front exhibition. This exhibition is in support of Dazzle & The Art of Defence. Since then nylon has become ubiquitous. Continued innovation and development has led to the creation of a wide range of nylon-blended fabrics that produce inexpensive, colourful, wash-and-wear clothing and the material can also be found in products ranging from kitchen utensils to medical implants. MoDiP has over 280 objects made from polyamide (nylon) including some fantastic 3D printed pieces that can be viewed or borrowed for inspiration. In 1938 the Washington News printed an article claiming that nylon could be made using cadaverine, a substance formed during the putrefaction of dead bodies. It was claimed that nylon was the material used to make the tornado that whisked Dorothy to the Emerald City in the 1939 film The Wizard of Oz. An alternative name proposed for nylon was ‘klis’ which is silk spelt backwards. Wallace H. Carothers was also involved in the creation of neoprene, a synthetic rubber commonly used in wetsuits, and had almost 50 other patents to his name by 1937. Unfortunately he committed suicide that same year. DuPont developed many other successful polymers including Teflon, Mylar, Kevlar and Lycra. In 1969, Neil Armstrong planted a nylon flag on the moon. We have recently opened our latest exhibition, Revolution: environmentally conscious design in plastics. It is an exhibition that has been inspired by the devastating images of plastics waste in oceans and streets, and is our way of highlighting the value of a material group that is so easily discarded. We start by thinking about ‘single-use’ becoming Collins Dictionary’s word of the year in 2018 and how they define the word as being strongly associated with plastics. 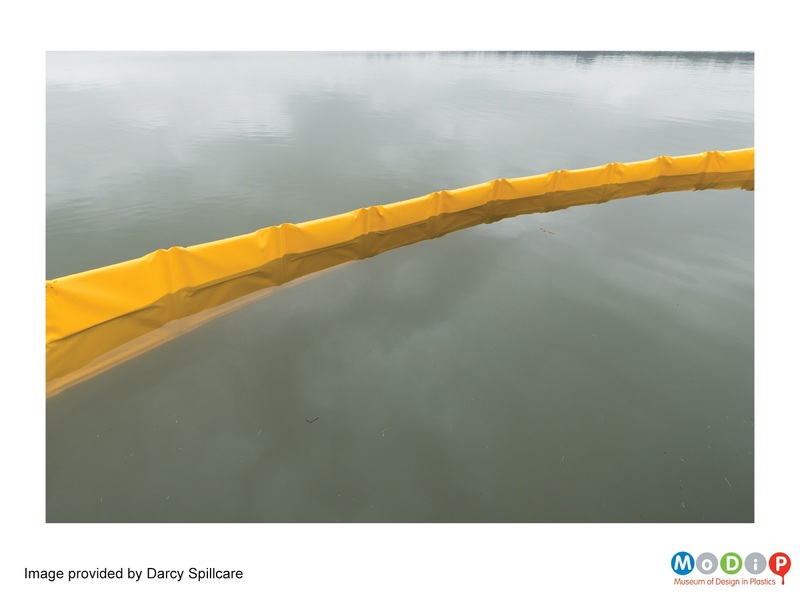 MoDiP wants to acknowledge that objects made of plastics that are in the wrong place, doing the wrong thing, and being disposed of without care, are indeed problematic to the environment. This has meant that plastics have become synonymous with the term ‘single-use’ and with environmental devastation; as well as the depletion of fossil fuel stocks, despite plastics being responsible for only 4% of crude oil usage. Some of the highlights in the exhibition are the upcycled and recycled products made from a variety of interesting starting points. 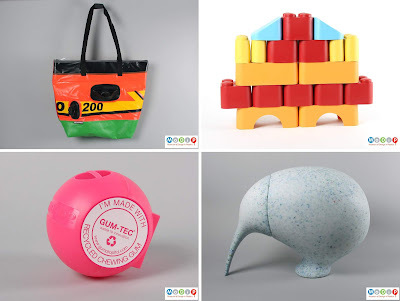 For example, a dinghy which has been made into a bag, milk bottles that have been made into building blocks, chewing gum that has become a collection bin, and toys that have been turned into a storage box. Top row l-r: Inflatable Amnesty bag, Wyatt and Jack, 2018. AIBDC : 008202. Blocks, Green Toys, 2011. AIBDC : 006138. Bottom row l-r: Gumdrop bin, Gumdrop, 2016. AIBDC : 007949. Kiwi, ecoBirdy, 2018. 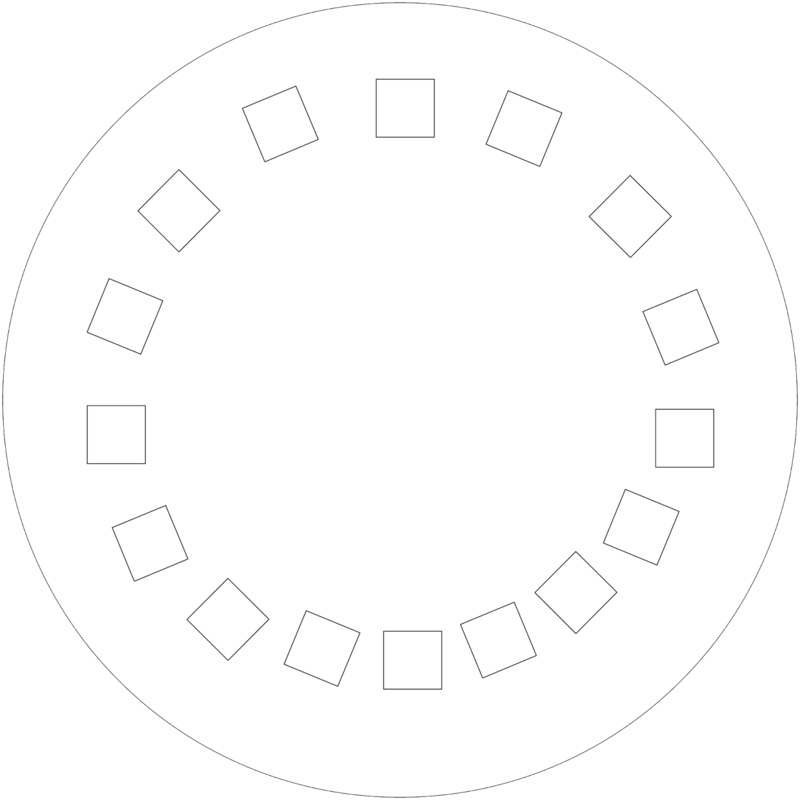 AIBDC : 008170. Image credit: MoDiP. Increasingly, when plastics are mentioned in the media, it is to report on the environmental damage that they cause. However, plastics can be used to play important environmentally supportive roles. One case in the exhibition, Plastics for good, looks at just a few of the examples of plastics products helping to preserve the environment. 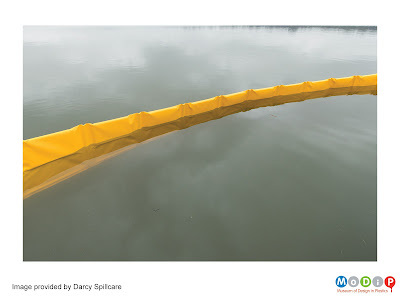 The most poignant object being the fence boom, a piece of plastic designed to go in waterways to prevent further contamination. In the Revolution exhibition, we are also exploring the difficult concept of ‘bioplastics’ and what is meant by the term. Bioplastics is confusingly used to mean either a material that is produced from a recently living organism known as biomass, as opposed to those that lived many millions of years ago and consequently creating fossil fuels, as well as materials that will biodegrade. However, not all plastics made from biomass are biodegradable, and not all fossil fuel based plastics are not biodegradable. It is generally thought that using materials that are made from biomass and/or are biodegradable is the answer to the waste issue that the world is experiencing at the moment. Yet, the bigger picture shows that these materials are not without their faults. Growing crops to make biomass for plastics diverts land from growing food for livestock and people; the compostable waste infrastructure is not in place to take biodegradable materials that need industrial settings to degrade properly; if these materials go in the recycling system they can undermine the resultant output; and finally if they end up in landfill they can produce methane, a greenhouse gas, as they breakdown. Creating products out of biomass and biodegradable material is one-step in the journey to reduce the impact on the environment, we just need refuse and waste infrastructures around the world to catch up. Revolution runs from now until 6th September we hope you can come and see the real thing but if not you can view the whole exhibition on our website. We want to do the same for animation. Taking a familiar art form that most people see everyday in one form or another, and making you take another look – making you think again. Utilising the phenomenal ability of plastics, to help us keep order to the chaos of the world around us, is exemplified in the Tupperware display MoDiP is currently showing. (https://www.modip.ac.uk/artefact/aibdc-005464). Tupperware can keep all manner of things separate and keep important substances apart. Our response to this is to create a 3D plastic printed animation displaying the chaos of disorder, which only becomes clear motion once a flashing light and rotating table are added. For us animation is the chaos in which only 3D printed plastic and a rotating table can find order. The zoetrope has moved along the pipeline of production well. 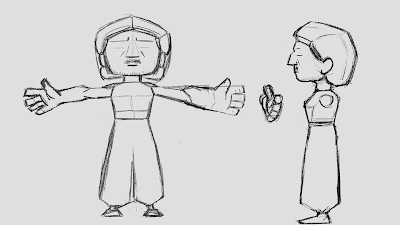 The conventional parts of the 3D animation process (line tests, modelling, rigging, and key-posing) have been relatively smooth. However, one key element of the rigging process called ‘Weight Painting’ has been a cause of some grief. Without it, the skeleton constructed during rigging would move independently of the model, leading to no animation. Not much help. When it is done badly, or as in this case, it is the first time using the tool, the model can not only animate badly, but break apart entirely. The loyal cart horse that is the phenomenally complex computer code behind 3D animation can easily buck and takes quite some calming down if it does. However, once a few pose tests were done, and the tool was grasped, the rigging was complete and the animation could progress smoothly to its eventual conclusion: a shot of a character viewed from one side only, as dictated by the filmmakers. 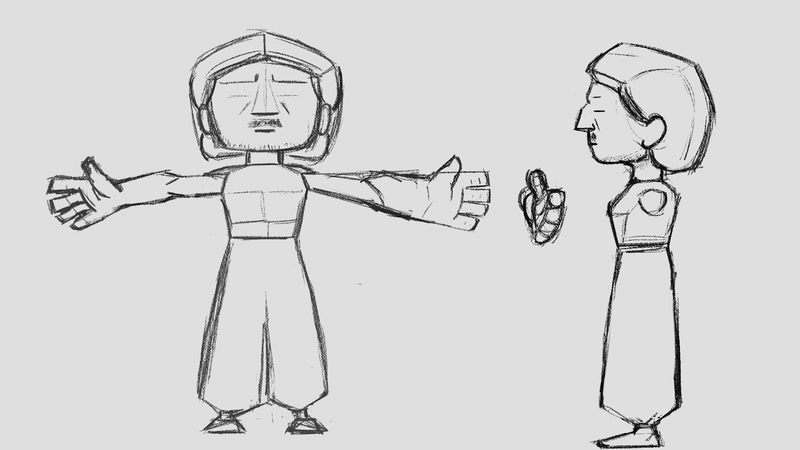 Displaying animation in such a way as to be able to look at the whole body, from any side, has forced me to improve my animation. The overall movement must read from any angle, the arcs need to work in a 3D space, no longer just a 2D plane, and the action has to read clearly from as many angles as possible. It is no longer animating on a virtual set, it is animating on a virtual theatre stage with a mobile audience. From here more characters will be added around the one I have done, by the other members of the team following the same process as myself. A good chunk of the usual process is complete. Now the transition begins - breaking the veil of Maya, pulling the curtain back between the illusion of the virtual world and the tangibility of reality is all that’s left to do. Simple. 1. 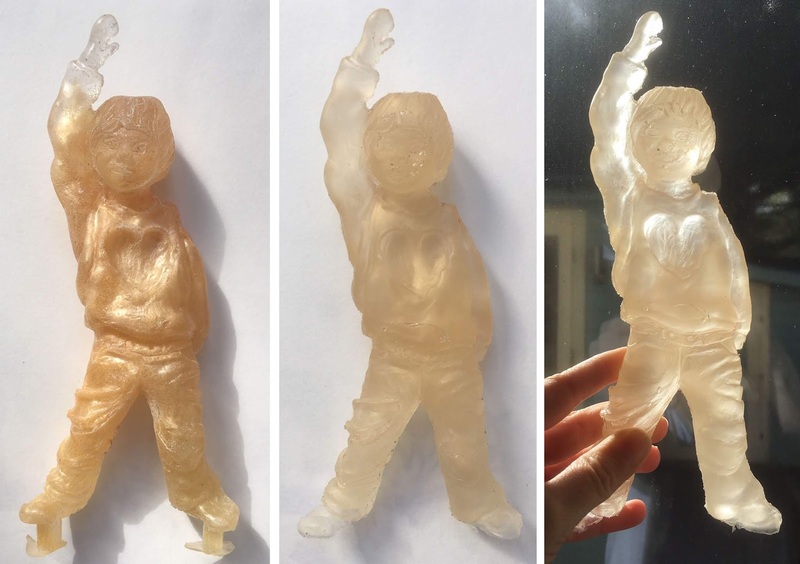 3D print the ‘frames’ of animation as individual models using the wonder material that is plastic. 2. Clean the models of any unforeseen elements of the printing process. 3. Laser cut a disk for the models to slot into perfect alignment for the animation. [see fig. 8 below of the plan for cutting. 4. 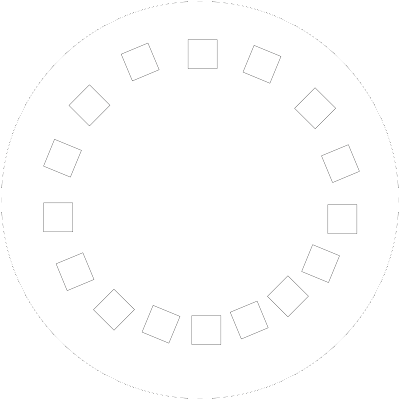 Put the parts together on a turntable using nuts and bolts. 5. Add the motor and flashing lights. 6. Watch the models come to life in an exhibition space. Each stage may pose new problems as this is the key challenge of the project – getting an animated performance sculpted in three dimensions. This challenge we will take one step at a time. Taking on a challenge is what animating is all about, we wouldn’t do it if it was easy. When making a pattern it can be interesting to use shapes from real life. The bowl that I used as my inspiration had a lovely bubbly shape to it. At first, for my Final Major Project, I was going to use Lectra - a pattern cutting software - to make the skirt. Then I started playing around with another pattern cutting software called Clo3d. I realised that the 3D virtual avatar in Clo3D, is much more realistic than the Lectra avatar. Out came the shape I was looking for, and I am happy with how it moves when I make the Avatar move. 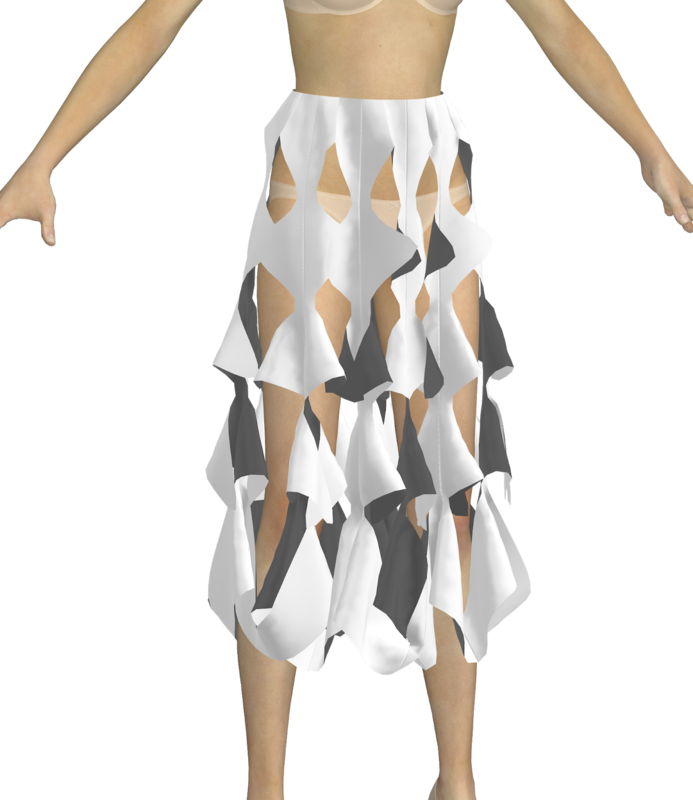 Since this is a virtual reality project, I want to make not only the skirt, but a top to go with it. For my final outcome I am going to have an outfit on virtual reality, that represents the inspiration I got from the MoDip museum. The last couple of months have taken me on a journey of discovery, in pursuit of making my heroic doll for paediatric cardiac patients. Recently this has seemed even more pertinent as February has been ‘heart month’ with social media flooded with stories from those waiting on the transplant list or having come through it, all emphasising the importance of organ donation. Moreover, ‘Max & Keira’s Law’ has been granted and will come into effect in England next year. An ‘opt-out’ policy for donor donation will replace the current ‘opt-in’, with the hope that there will be an increase in organ donation, as has already been seen in Wales (https://www.bbc.co.uk/news/health-47359682). For those unfamiliar with the background of this law, Max received his life-saving heart transplant from a young girl, Keira, who died tragically in a car crash. The brave and selfless act of her parents at such a difficult time meant that Keira was able to save four lives through organ donation, including that of Max. 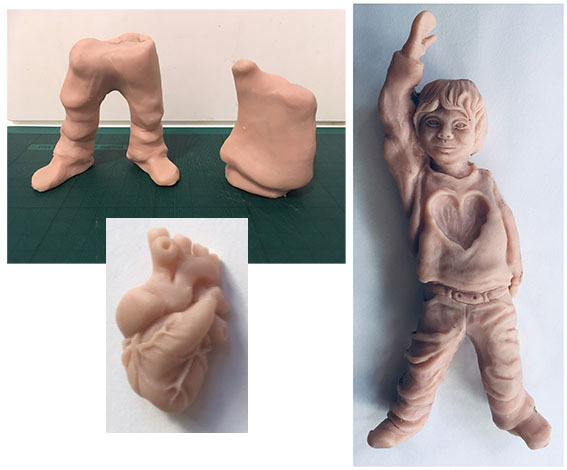 Although my overall intention is to provide an educational and positive doll for children suffering with heart conditions, time constraints have meant that I have focused specifically on creating a doll that will have an interchangeable heart that illustrates heart transplantation or heart improvement through medical management. Practically, I have been very fortunate to have had the help of Ben Diamond, AUB Technician Demonstrator. Without him, I think I would have struggled to get to the place that I am currently. So, what have I achieved so far? I designed my first doll, based on some heroic poses of my son. I then modelled him from polymer clay. This medium is very appropriate for this project as it is made from a plastic PVC base and perfectly suits my intentions for casting in resin. This was the first time I had used this product and initially I found it easy to model, however it soon became too soft and difficult to keep its form, especially when I attached the torso to the legs. A few YouTube videos later and I learnt that you can harden it in the freezer for a short while, to prevent it becoming too soft to work with. I completed my figure and made a small anatomical heart to insert into the heart-shaped space I had created in the torso. Unfortunately, I did this a bit too big so will have to consider this in my next, and final design. Once baked and hardened in the oven, I made my silicone mould (another rubberlike plastic medium) and utilised the expertise and resources of the model-making workshop to cast my model in resin. This is quite technical, and I hadn’t anticipated this being the most difficult aspect of the project. My first attempt resulted in a resin figure filled with bubbles and unevenly dispersed colour resin powder. The heart was ok but still contained some bubbles. On Ben’s advice, I decided to use a slower setting resin that would allow time for the bubbles to rise and disappear. This did work much better although, with the bubbles disappearing, the resin sunk, and the feet of the figure were not filled fully. Despite this, the quality of the resin was much better, and I now feel confident to create a new design and figure. I might simplify the design and also refrain from using an iridescent resin powder, preferring the clarity of a colour tint instead. I also intend to simplify the facial features as the detail was not so effective in resin. 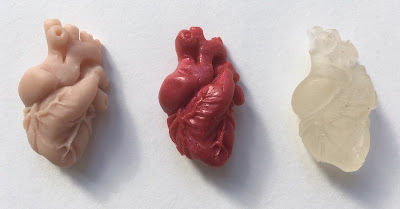 I hope that the translucent figure will complement the more opaque heart/s and intend to use magnets to make these interchangeable. My intention would be for this doll to be placed by a child’s bedside, perhaps with a table lamp lighting up the figure and projecting a sense of hope at a time of uncertainty.